Israel allows hundreds of trucks of food and supplies into Gaza to avert humanitarian crisis, as Hamas uses human shields. 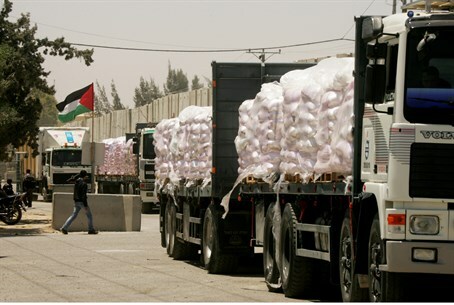 Despite the ongoing rocket fire by Gaza terrorists, Israel has not halted the entry of trucks into Gaza – and on Thursday, some 200 trucks carrying food and “basic supplies” entered Gaza. The government said that the trucks were allowed to pass through for “humanitarian purposes,” and were inspected and found not to be carrying any items or equipment that could be used to attack Israel. The trucks are said to be carrying a greater than normal supply of food, officials said. According to sources, the IDF and Defense Ministry officials urged the government's Coordinator of Government Activities in Judea, Samaria and Gaza, Yoav Mordechai, to allow an increased amount of supplies into Gaza, so that residents would have enough to eat in case the IDF begins a ground assault against Hamas. The trucks enter Gaza through the Kerem Shalom crossing, which is often targeted by Gaza terrorists for missile attacks. The workers at the crossing are all Israeli, and have been given special safety instructions by the Home Front Command, officials said. It should be noted that one of the terror tunnels destroyed by the IDF several days ago was located right next to the Crossing. With that, officials said, the IDF has pulled two “gestures” granted after the conclusion of Operation Pillar of Defense in 2012. Palestinian Arab farmers have been banned from tending to their fields which abut the security fence around Gaza, and cannot approach within more than a few hundred meters of the fence. In addition, fishing boats have been restricted to within three kilometers of the Gaza coast. The IDF has also allowed 240 Palestinians with foreign citizenship to leave Gaza, at the request of their governments. Among them are citizens of the US, Sweden, Greece, Romania, and Serbia. They will be allowed to leave the country, or to travel to Palestinian Authority-controlled areas of Judea and Samaria. It goes without saying that the IDF has not taken steps to cut off Gaza's electricity, which is supplied by Israel, as numerous ministers and MKs have demanded. IDF officials said that among the reasons for allowing the shipments to continue and the power to flow was to prevent Hamas from painting a picture of a “humanitarian crisis” in Gaza, in which people have no food, water, or power. In contrast to the IDF's concern for the well-being of civilians in Gaza, Hamas, the Islamist group which controls the territory, has urged residents to act as human shields, placing them directly in harm's way - sometimes with tragic results. On Wednesday night, Hamas spokesman took to Gaza-controlled TV to openly admit that the group is using civilians as human shields, and encouraged more Gazans to act as such.